Looking for a Chiropractor in Oklahoma City? 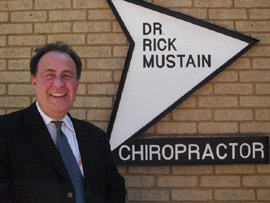 Our mission at Mustain Chiropractic Clinic is to increase an individuals natural life, attitude and better well-being. We believe in educating each person on how they can help themselves to a better life through long term relationship building. Mustain Chiropractic Clinic uses state of the art Chiropractic technology that is oriented toward family, pediatric, athletes, and motor vehicle injuries. We strive to develop a wellness style of life for each person through emotional, physical, and chemical for future health dividends. This has resulted in the most soul-satisfying and deep fulfilling aspect of our practice, by watching our patients from Oklahoma City, Edmond & Yukon growth to a better life. Call Mustain Chiropractic Clinic – We want to help you! Call Mustain Chiropractic Clinic in Oklahoma City to arrange a consultation today and find out if you’re a good candidate for today’s chiropractic care! I was most pleased with my first visit and I have experienced less pain after each visit. I am feeling almost 100% better now. I would not hesitate to recommended Dr. Mustain to friends or family.